We supply various pastes for detecting free water in Crude Oil, Petroleum products together with pastes for the accurate indication of product levels in Crude Oil, Petroleum products and other hydrocarbons. 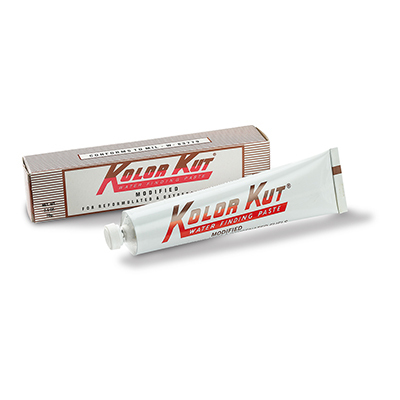 This paste is golden brown in colour and turns brilliant red upon contact with water. This product will successfully gauge water content in all petroleum and hydrocarbons as well as sulphuric acid, nitric acid, hydrochloric acid, ammonia, soap solutions, salt and other chloride solutions. Supplied in 3oz Tubes @ £4.45 Per Tube. £53.40 per Box (12 Tubes per Box). 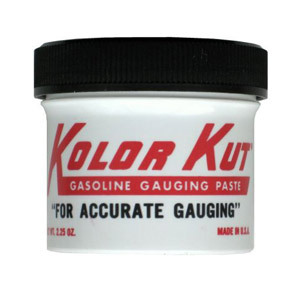 This paste is a light pink paste which turns to a contrasting bright red upon contact with petrol or gasoline, naphthalene, kerosene, Crude oil, fuels, Petroleum products and various chemicals. Supplied in 2.25oz Jars @ £4.45 Per Jar. .£53.40 per Box (12 Jars per Box). Designed for use in Methanol, Ethanol enriched Fuel Systems. Alcohols are soluble in fuels, in all proportions, when they are water-free but relatively small amounts of water can cause separation of alcohol from the fuel. The mixture settling to the bottom of the storage tank contains a high concentration of alcohol and cannot be detected by most water detection pastes. The paste changes from dark brown in colour to bright red on contact with water. Phase separated alcohol solutions, with as little as 6% water, will turn the paste yellow. This product is designed for use in reformulated and oxygenated fuel systems. After testing, it seems that alcohol or de-icing agents in fuels have very little effect on the performance of the product. Supplied in 2.25oz Jars @ £5.60 Per Tube. £67.20 per Box (12 Tubes per Box). Vecom water finder special is a product that, by becoming bright red if it in contact with water, shows presence and level of water under gasoline and other light mineral oils. Supplied in 70gm Tubes @ £6.15 Per Tube. £123.00 per Box (20 Tubes per Box). Vecom gasoline finder is a product to detect the level of gasoline and other light mineral oils by turning red and makes it easy to determine the product level. Supplied in 60gm Tubes @ £5.55 Per Tube. £111.00 per Box (20 Tubes per Box). Test Papers are used with Dipping Tapes in Oils that can not be tested with a paste, such as in Edible Oils. Supplied in packs of 100 '362mm x 10mm' Strips.